This time around, Corvo Attano will speak for himself. The Dishonored 2 voice cast has been revealed over on GameSpot, and I think you'll agree that it's solid. The lineup for the sequel to Arkane's hit stealthpunk game will include Vincent D'Onofrio, Rosario Dawson, and Pedro Pascal, and the previously-silent protagonist Corvo Attano will now have a voice of his own, too, courtesy of the guy we used to call Garrett. D'Onofrio, who was so stunningly good as the Kingpin in Netflix's Daredevil series (and, let's be honest, everything else he does), will voice Luca Abele, the Duke of Serkonos, while Dawson, who also did a turn in Daredevil and has featured in films including Sin City, Grindhouse, and Unstoppable, will portray Dreadful Wale Captain Meagan Foster. Pascal, he of the memorable head pop in Game of Thrones, will appear as the leader of the Howler Gang. Joining them will be Sam Rockwell as Mortimer Ramsey of the Dunwall City Watch, Jamie Hector as Vice Overseer Liam Byrne, and Robin Lord Taylor, who replaces Billy Lush as the Outsider. The co-lead character of Emily Kaldwin will be portrayed by Erica Luttrell, who has provided voices in games including Diablo 3, World of Warcraft, Fallout 4, and XCOM 2, while Corvo Attano, who was a silent protagonist in the first game, will be brought to life by veteran voice actor Stephen Russell. With all due respect to everyone else in the cast, Russell's appearance is the real treat here. He's provided voices for numerous games over the years, most recently for Nick Valentine in Fallout 4, but he may be best known, at least among a certain vintage of stealth aficionados, as Garrett, the lead character in the seminal stealth series Thief. 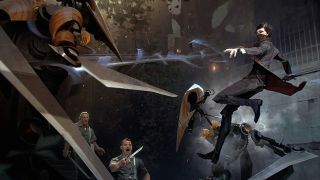 Dishonored is, in many ways, the spiritual successor to that franchise—we actually made note of the similarity in a hands-on preview—and so having Russell give voice to its male lead is a very nice touch. Dishonored 2 is slated to come out on November 11.